Every State is Different. 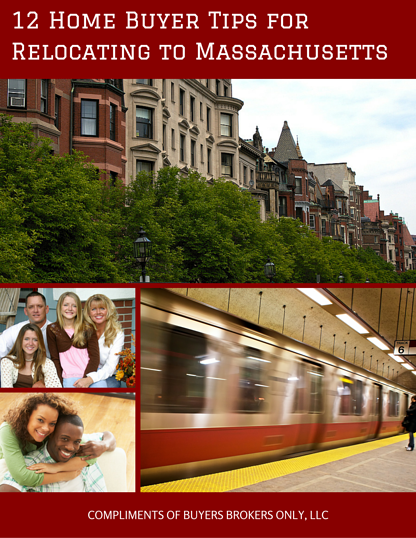 Familiarize Yourself with Buying Real Estate in Massachusetts. • Do Massachusetts home buyers pay a transfer tax at the time of closing? • What public transportation options are available in the Greater Boston Area? • Are sellers in Massachusetts required to provide home buyers with a property disclosure? • Are home inspectors licensed in Massachusetts? Please fill out the form on this page to receive your free guide for home buyers relocating to Massachusetts. "We used Buyers Brokers Only ... for our corporate relocation and we couldn't be happier with our choice. They were incredibly professional and responsive in our search for a new house in an area that we didn't know much about. We actually closed on our house while we were still living in Germany and the entire thing went like clockwork. Absolutely no issues. We highly recommend them for anyone purchasing a home." – Crystal S. & Mark S. Bought in Norwell, MA. "Cannot say enough about how great it was to work with ... Buyers Brokers Only, LLC throughout the process of finding and negotiating the purchase of our first home. My husband and I had recently relocated from out of state for his job transfer ... and were unfamiliar with many of the towns around Boston that might satisfy our various and sometimes divergent lifestyle requirements." – Ellen M. & Skip M., Bought in Newbury, MA.